I just wanted to report another issue. I flew to EDDF and was in the descend towards EDDF. The blue arrow, that shows the point, where the aircraft will be levelled off during descend to the programmed lower altitude moves along the programmed flight path. So long, everything is finde. 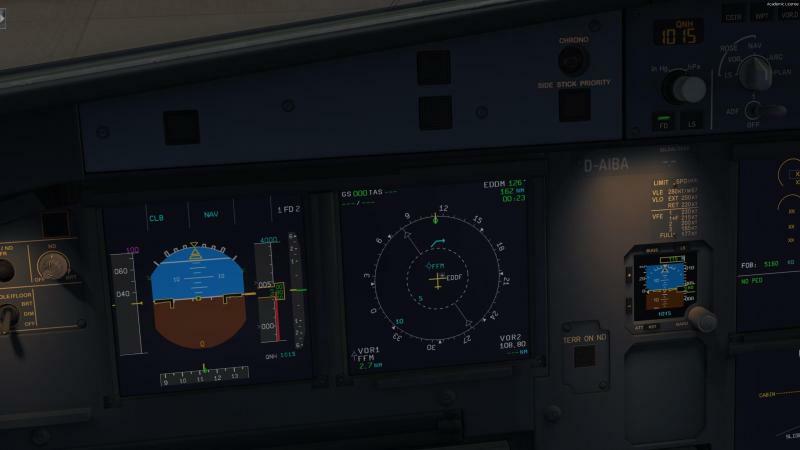 But when I switch to selected heading (heading mode), the blue arrow stays stuck to the flight path, I don't follow anymore or it hovers arround on the ND somewhere between the final approach course (so the ILS flight path so to say) and the selected heading path. I think it should then stick to the selected heading path, which goes straight forward. In the old Bus, that did work. Is there a bug or am I doing something wrong? I just leave the programmed flight path and select a new heading and the blue arrow is not where it shoul be, see picture below. I did not see this on every flight. It seems to be related to how you leave the programmed flight path/route. In this case I think I flew a PSA STAR into EDDF and left the flight planned route at about PSA and selected a heading of 330 for the ILS 25L. Flight plan was ETASA T163 PSA if that helps. Thanks for the report, we'll look at it. just wanted to add another image of the issue. Programmed the ROLIS25N transition in EDDF, but before turning left parallel to the runway 25R, ATC instructed me to turn left heading 070. The blue arrow stuck to the programmed flight path instead of moving to the green heading line, as seen on the picture. I just saw, that the blue arrow is also placed incorrectly, while parked at the gate. I parked there and set the initial climb to 4000ft. The blue arrow was then seen on the ND hovering arround as I didn't load the flightplan yet. I would think, the arrow shouldn't be seen at this stage at all. Maybe you can have at look at this, too. 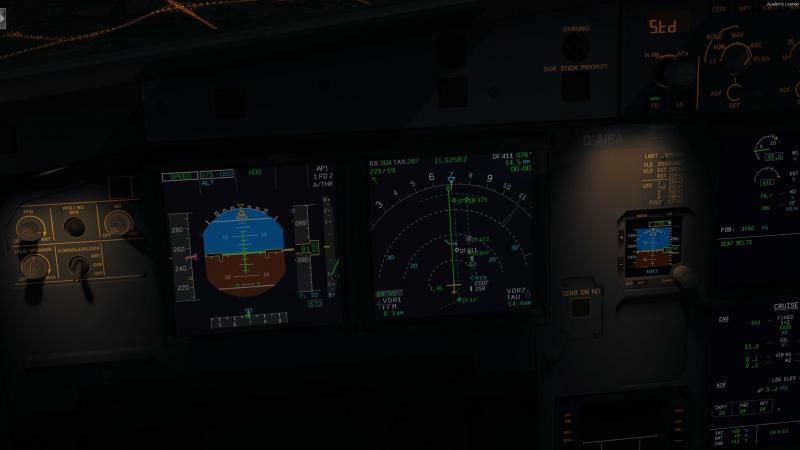 Edit: Is this normal when I set the initial climb and pull the knob or should the blue arrow not be seen at all while on ground or at least not when no flight plan is loaded?